Dogsafe pet alert stickers are the only ones created by an emergency responder, for emergency responders -- a simple design that is easily recognizable by fire, police, paramedics and search and rescue. ​Waterproof, UV-resistant, and three specific designs: (1) single dog (2) up to three dogs or (3) dog/cat/other. Two Dogsafe Pet Alert Wallet Cards included. Why ours are different plus FAQs. Our Dogsafe Journal: The Ultimate Resource to Record Your Dog's Health, Wellness and First Aid, is full of charts, lists and diagrams so you can easily and accurately track your dog's health, throughout their entire life. Dogsafe Journal (PDF) $14.95 Canadian (approx $11.50 US) NEW! Instant download, ready to print. Also available in a Cat Journal version. ​Our Dogsafe 101 course manual is now available in a 4.25" x 5.5" travel size -- about the size of a cell phone. Perfect for first aid kits, glove boxes, dog walker backpacks, grab n go bags, hiking backpacks and more. Spiral-bound for durability. 152 pages. *Two free unlaminated wallet cards included with a pet alert sticker order or Dogsafe travel-size manual order. If you're in an accident and cannot speak, who will alert emergency responders that your dog is home on their own? If you are transported to the hospital, who will go help your dog? Or if your dog was with you in the car, you'd rather have a friend help than her being transported to the local shelter, right? Me too! Here's another simple design that is easily recognizable in your wallet and will alert fire, police and paramedics to call your emergency contacts on the back. Size of standard business card, 3.5" wide x 2" high and comes with self-laminating pouches to apply after you've written your emergency contact information on the back. You see a dog in a hot car... what do you do first? How do you coordinate volunteers who offer to help? How, and what, critical information do you document that the police, animal control or a veterinarian will want to know? Dogsafe Canine First Aid has made it easy with our Dog in a Hot Car Responder Checklist mobile app. Through twelve screens, get step-by-step guidance to respond and document your actions, then send data to police, animal control and veterinarians. ​Concerned about dogs left in hot cars? You need Dogsafe's Dog in a Hot Car Responder app! Dog in a Hot Car Responder Checklist mobile app $2.99 NOW FREE! Take a front row seat in our Dogsafe Canine First Aid 101 course. The DVDs are designed for dog owners and dog professionals and feature former police officer and dog trainer, Michelle Sevigny (me! 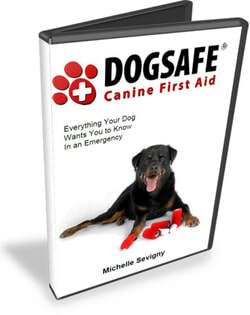 ), creator and head instructor of Dogsafe Canine First Aid. The DVDs are professionally filmed and edited by documentary filmmaker and Dogsafe graduate, Laurie Kindiak. Take a front row seat in our Dogsafe Canine First Aid 201 workshop and watch Dogsafe 101 student graduates apply their new skills on their own live dogs. 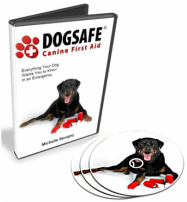 The DVDs are designed for dog owners and dog professionals and feature former police officer and dog trainer, Michelle Sevigny, creator and head instructor of Dogsafe Canine First Aid. The DVD is professionally filmed and edited by documentary filmmaker and Dogsafe graduate, Laurie Kindiak. The first step to preparing for a canine emergency is to have the knowledge and skills. The second step is to have the essential supplies at hand. Check here for shipping and tax information. Check here for return policy. Creating and operating Dogsafe's free community projects takes thousands of heart-filled volunteer hours. If you see the benefits and value of our community projects, please enroll in a Dogsafe Canine First Aid course or purchase Dogsafe products, your registration fees and purchases help support the development of new projects and operation of existing projects. Thank you!